An IOU bearing the state controller's signature. After taking multibillion-dollar bailouts from the federal government, some of the nation's biggest banks are declining to lend a hand with a different financial mess: the California budget stalemate. The banks, including JPMorgan Chase & Co., Bank of America Corp., Wells Fargo & Co. and Citigroup Inc. and some regional banks, are trying to pressure lawmakers to end the impasse by warning that, after Friday, they won't accept IOUs issued by the state. The move would leave many businesses and families with pieces of paper and fewer options for getting their money immediately. Government officials and consumer advocates say the banks should be more sympathetic, especially since they've been the direct beneficiaries of taxpayer dollars. "If they hold to that stance, then there's potential for hardship being suffered by the recipients of IOUs," said Tom Dresslar, spokesman in the California Treasurer's office. Unless recipients are able to hold IOUs until Oct. 2, the official redemption date, "they'll have to scramble" to feed their families and meet obligations, Dresslar said. At Rhodes Consolidated Inc. in Galt, Calif., owner Fred Rhodes said that if banks stop accepting IOUs, his family's income will suffer and the company will likely have to stop paying its own vendors. The industrial supply company provides state agencies with plumbing and electrical parts. 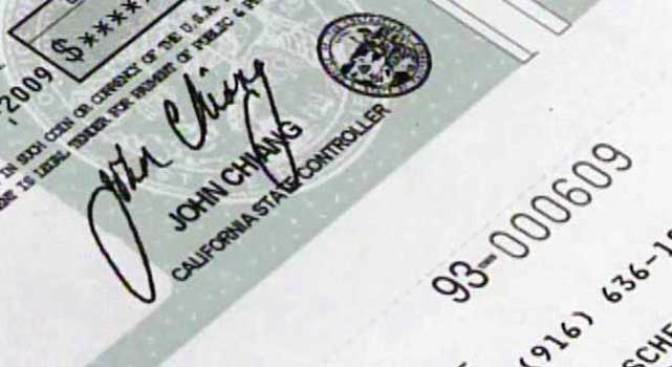 As California legislators haggle over how to close a $26.3 billion budget deficit, the state is expected to send out $3.3 billion in IOUs this month to private contractors, state vendors, people getting tax refunds and local governments for social services. It is the first time since 1992, and just the second time since the Great Depression, the state has sent out notes promising repayment at a later date instead of paying its bills on time. The IOUs carry an annual interest rate of 3.75 percent. Some banks are already placing limits on the IOUs, accepting them from existing customers only. "We would like for the state to resolve its budget issues as soon as possible," said Tom Kelly, a spokesman for JPMorgan Chase. The bank said it was in contact with California state officials for several weeks leading up to the decision to start printing the IOUs. At Bank of America, which counts the state of California as a commercial client, existing customers can only deposit IOUs -- and only until Friday. "We don't want acceptance (of IOUs) to deter the state from a budget agreement," bank spokeswoman Julie Westermann said. But that strategy could backfire for banks that already have an image problem after taking tens of billions of dollars from the government to make up for the losses they suffered on risky mortgage investments. The banks "can come up with any justification they want, but there will be extreme anger," said Stan Collender, managing director at Qorvis Communications, a business consulting and public relations firm in Washington. If businesses and families suffer because they couldn't cash IOUs, the banks will be viewed as "another bad guy," Collender said. JPMorgan Chase and Wells Fargo each received a $25 billion federal bailout in October. JPMorgan repaid the U.S. Treasury last month. Bank of America and Citigroup each received $45 billion in multiple installments between October and January. Each also benefits from guarantees against losses -- $7.5 billion for Bank of America and $5 billion for Citi. The banks could also find themselves losing customers to institutions willing to keep accepting IOUs. Some credit unions have been more flexible by not setting a deadline, according to the California Credit Union League. Nearly 60 have already said they would accept the IOUs and only two might stop accepting them on Friday, league spokesman Henry Kertman said. The federal government has not so far intervened, but it could pressure the banks to continue accepting the IOUs. "Clearly, the federal government has leverage over these institutions," said Matthew Lee, executive director of Inner City Press-Fair Finance Watch, a Bronx, N.Y.-based consumer advocacy group. Hundreds of banks have received aid from the government as part of its $700 billion rescue plan last fall. In 1992, IOUs were sent out during a stalemate between then-Gov. Pete Wilson and the Legislature. Some banks initially accepted the IOUs, but began declining them as the impasse continued. If that happens this time, some alternatives could be set up to help customers awaiting payment from the government. "They're certainly not just abandoning their customers as of July 10," Beth Mills, a spokeswoman for the California Bankers Association said. Mills said that while banks might stop accepting the IOUs, many might issue loans or establish lines of credit with customers instead. Bank customers could then repay the short-term loans in October after the state makes good on paying the IOUs. Another possibility is that a secondary market could be established to buy up IOUs. SecondMarket, which creates marketplaces for the trading of illiquid assets, has received "decent interest" from potential buyers of the IOUs, said Jeremy Smith, the New York-based company's chief strategy office. SecondMarket will likely create a process for trading the IOUs if banks stop accepting them. Hedge funds and municipal bond and distressed asset investors have already expressed interest in finding a place to purchase the IOUs, Smith said. But pricing in a secondary market is still murky and customers could end up getting less than face value. Vendors and contractors holding IOUs could potentially use them to pay state taxes, fees and liens under a bill passed by a state Assembly committee Tuesday. The bill would require the state to accept its own IOUs in lieu of money owed the government. That could help a company like Noah Homes, which operates eight homes for 70 developmentally disabled adults in San Diego County. CEO Molly Nocon said that if Noah Homes could use IOUs to pay state licensing fees, payroll taxes and other state costs, it could save about $150,000 a year. "If we could avoid that, it would keep us in business another couple of months." If using the IOUs to pay government fees and taxes is not possible, the situation becomes more difficult. Nocon said the company might have to tap a $500,000 line of credit, which could help the company stay in business for about four months, she said. But that would mean Noah Homes would also be running up interest charges.